We often take our eyes for granted until the time we begin to face problems with our eyesight. It is often observed that unhealthy lifestyle and ignorance on taking proper care of our body leads to health disorders, which if not detected at an early stage, can lead to serious problems. Pollution, increase in the use of electronic gadgets, and lack of adequate knowledge to care for our eyes often leads to the gradual degradation of its health. 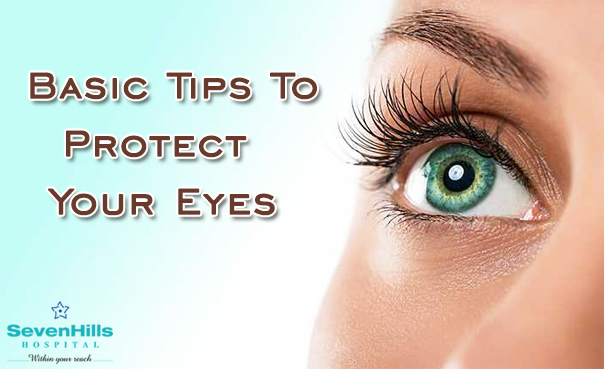 Here are some tips that can help you in keeping your eyes healthy and in maintaining good eyesight. Eating a healthy diet that includes green, leafy vegetables, salmon, tuna, oily fish, eggs, oranges, nuts, beans, citrus fruits or juices, and so on will not only help in clearing your vision and making your eyes healthy, but will also help you in maintaining a healthy weight. Being overweight causes health disorders like type 2 diabetes and others, which are a leading cause of blindness in most adults. Tobacco and nicotine make you more likely to fall prey to cataracts, macular degeneration, and optic nerve damage. Try to quit smoking at the earliest as smoking is not just injurious to the eyes, but it is far more injurious to the lungs and your overall health. Whether you’re stepping out of the house, wearing lenses, or playing some sport, it is always advisable to sport sunglasses or eye-protecting material like helmets to shield your eyes. The sun’s harmful UV rays and sports materials are capable of causing damage to your eyes and sight. Hence, it is ideal to wear an eyewear for added protection. Sitting at a close distance, in an uncomfortable position, and for long hours before the computer and television can damage your eyes big time. These things can cause eyestrain, blurred vision, dry eyes, and neck, back, head, & shoulder pain. To avoid this, sit at a distance of minimum 5 feet away from the TV and at an arm’s distance from computer monitors in an upright position with elbows and legs rested at 90 degree angle. Blink your eyes often, and take a small walk every 20 minutes. Whether you’re very young, middle-aged, or an adult, it is highly recommended to visit your doctor regularly and get your eyes and eyesight checked up. Regular checkup can help in identifying the condition of your eyes, and can also help in the early detection of eye-related diseases. Be cautious, be healthy; as eyesight once lost, is lost forever!